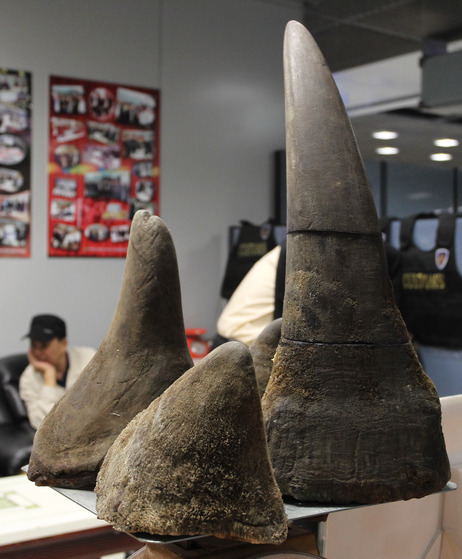 Alleged Vietnamese smuggler Pham Quang Loc, 56, sits behind rhino horns seized at Suvarnabhumi airport in Bangkok on Jan. 6. Rhino horn is seen as a miracle cure-all in Vietnam — an expensive, medically unproved and illegal product that experts say is devastating the global rhino population. Some newly rich Vietnamese believe rhino horn — used in traditional Chinese medicine — can now treat all kinds of illnesses. Last year in Vietnam, rhino horn sold for up to $1,400 an ounce, which is about the price of gold. The power of East Asian demand was on stark display last year after South African authorities confiscated a videotape hunters made of an illegal rhino kill. In the video, a hunter fires on a rhino as it shades itself beneath a tree in a game reserve. The rhino tries to escape, emitting a high-pitched cry, before eventually being brought down by steady gunfire. Conservationists say much of Africa’s rhino horn ends up in Vietnam. 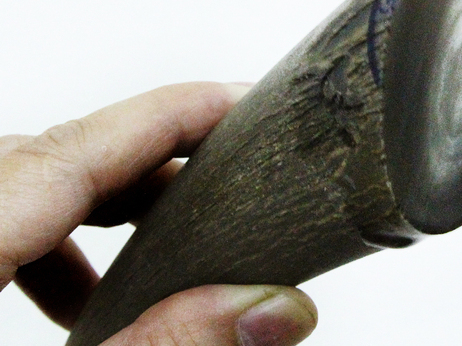 On a single day in January, authorities detained two Vietnamese men in Bangkok and Ho Chi Minh City, trying to smuggle a total of almost 60 pounds of African horn worth a combined $1.5 million. “The smuggling of rhino horn has been on our radar since 2006,” says Douglas Hendrie, a technical adviser toEducation for Nature, a Vietnamese nongovernmental organization. Hendrie says demand has been driven by sudden wealth and medicinal misinformation, including Internet rumors that rhino horn can cure cancer. In surveys, users say they believe rhino horn improves general health, prevents illness and treats about 30 different ailments, including hangovers. That’s how Bui Thanh, a retired official who used to approve construction projects in the Vietnamese government, got his stash of rhino horn. Bui began taking rhino horn to recover from drinking binges with contractors. Nguyen Huong Giang, 24, grinds rhino horn with water at her apartment in Hanoi, Vietnam, in 2012. She ingests the liquid concoction after drinking too much alcohol or when suffering from allergies. Sitting at his breakfast table, he unwraps a piece of newspaper to reveal a small, gray block of rhino horn he received as a gift. Bui pours water into a specially made bowl with a rough bottom and grinds the block of horn into a milky, white liquid. The grinding creates an odor that smells like burned hair. That’s because rhino horn contains keratin, the main component in fingernails and hair. He says that as the value of rhino horn grew, it became a kind of currency. Rhino horn prices are so high, some medicine shops sell fake rhino horn made from buffalo horn. Bui says some people even make rhino horn out of industrial plastic. Given the staggering price both consumers and the rhinos themselves are paying, does rhino horn actually do anything? Vu Quoc Trung, a traditional medicine doctor who works out of a Buddhist pagoda in Hanoi, thinks it has some limited value. 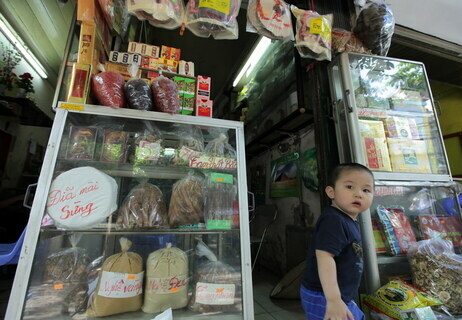 A young boy walks out of a traditional medicine shop in downtown Hanoi that sells grinding plates for rhino horns. Contrary to popular myth in the West, rhino horn was never traditionally viewed as an aphrodisiac. As for all the other ailments some doctors here prescribe it for — such as cancer — Vu doesn’t buy it. In fact, after China banned the rhino horn trade in 1993, it was removed from traditional medicine books in the country. As with most illegal products, rhino horn’s real demand isn’t easy to gauge, but Bat Trang, a porcelain-making village outside Hanoi, offers some clues. This is where Bui bought his rhino-grinding bowl. Nguyen Thi Le Hang owns a factory here that’s made rhino bowls for at least the past decade. Nguyen says when she started, some of her best customers were hard-drinking pilots. 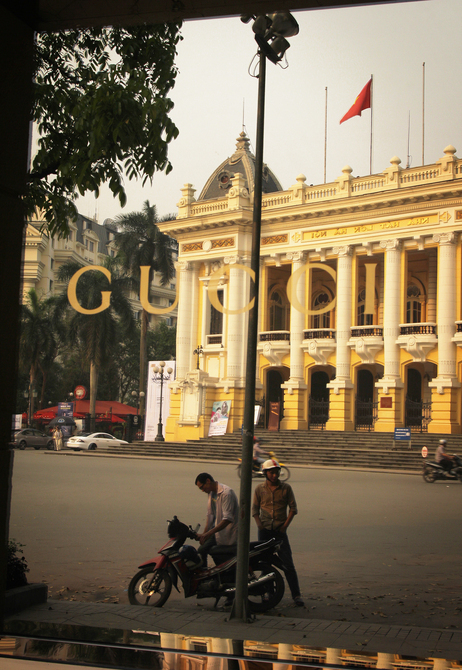 The rise of Vietnam’s economy — captured in the reflection of Hanoi’s famed opera house in this Gucci boutique — threatens the survival of rhinos thousands of miles away in South Africa. Last year, Nguyen says, she sold 10,000 bowls. TRAFFIC, a global organization that tracks the wildlife trade, says no other country has a grinding-bowl industry like Vietnam’s. Naomi Doak, the group’s coordinator in Hanoi, says the rhino horn trade has flourished here because there isn’t a lot of enforcement. Vietnam insists it strictly prohibits the illegal trade in wild animals. Last year, it signed a memorandum of understanding with South Africa to cooperate on the issue. Conservationists think the key to reducing demand is education. Nguyen Quan, who works in the wildlife crimes unit of Education for Nature, uses public awareness campaigns to debunk rhino horn myths. He tells anyone who will listen that rhino horn is basically a grossly overpriced placebo. South Africa is home to more than 20,000 rhinos, the vast majority of the global rhino population. Getting people in Vietnam to focus on a creature so far away isn’t easy. Bui, the government official who took rhino horn for hangovers, said protecting the animal isn’t his problem. Some rhino horn users, though, seem to be having a change of heart. A woman named Duong, 50, who works in international trade, says she used to take rhino horn as a general health tonic, but found it didn’t do much, so she stopped using it. How many others rhino horn users here are coming to the same conclusion is anyone’s guess, but the rhino’s survival may depend on it.